It began on the Fourth of July. It still hasn’t ended. I was so comfortable, I declined any nail-polish removal to see how my friends in Sangkha would react. This is the story of that psychological experiment. There’s a simple way to explain the reactions – women love it, men don’t. The women-filled office I work in was also laughter-filled when they saw Erin’s artistry. I asked them if they liked it and they said yes. When I asked the men if they liked it, they said no. Walking into classrooms, I feel like a big-breasted woman showing plenty of cleavage only with all eyes going to my toes instead of my chest. 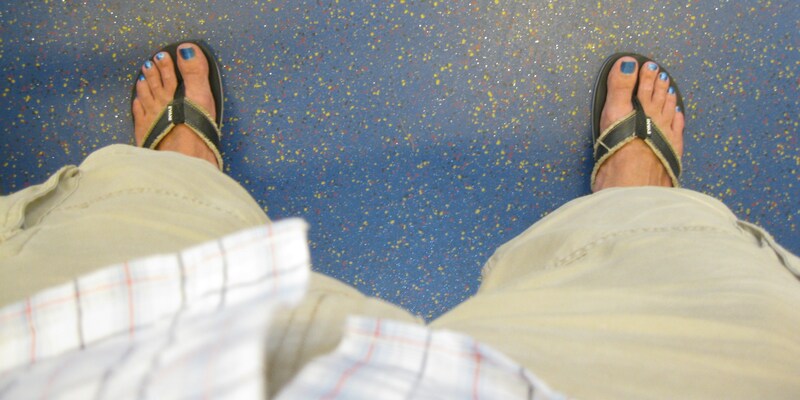 I see the Thai kids looking at my toes and can almost read their minds – Why? Is that something all Americans do? Is this why he doesn’t want a Thai girlfriend? A week after reconnect I met a number of friends in Khon Kaen for a four-day weekend. They were surprised to see I still was sporting the experimental look. I’d let a girlfriend do the same once in the states, but there’s a big difference – I didn’t wear sandals every day. I enjoy watching the Thais minds work when I tell them the painted toenails are in honor of the independence of America. They say, “Oohhh,” and stop laughing. Huh. That must be some cultural ritual done in America I don’t know about. Do ALL the men paint their toenails to celebrate the country’s independence? When Thai men notice it, they seem to be afraid of me. It’s as if I’m a new kind of man they have yet to encounter – a man not afraid to have his toenails painted. Why is it so feminine anyway? If they were painted a more “manly” color, would they be as offensive? What if I painted them black? When did painting ones toenails become something just for women? As I write this, the polish is creeping up to the ends of the nails and a lot of it has chipped off, but it’s still noticeable. I’m still getting double takes, but I get double takes being a tall white guy anyway, so what’s the difference? I encourage all Peace Corps Thailand volunteers – men and women – to paint their toenails. This is a nation that accepts lady boys. A little nail polish isn’t going to offend. 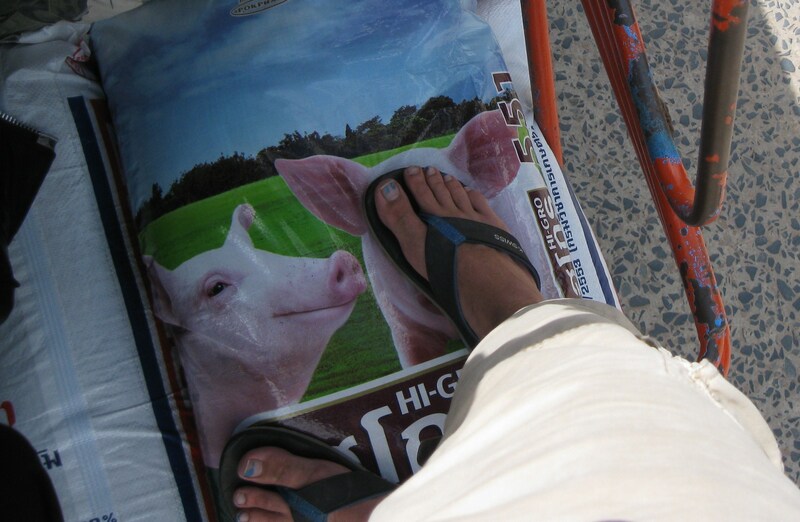 This entry was posted in Peace Corps and tagged peace corps, thailand, toenails by Jeff Jackson. Bookmark the permalink. I had to laugh when I read it was my daughter Erin who painted your toes! Watch out next time u get together, I sent a rainbow of colors for Christmas. Hope u r enjoying Thailand and Happy New Year!